General Manager Peter Sibly, and Board Members Janet and Mea, successfully purchasing RAPID property #5 at auction. United Housing Cooperative (UHC) was successful in obtaining funding from the from the State Labor Governments RAPID Housing Assistance Fund to purchase eight new properties to be located in the City of Maribrynong and City of Hobsons Bay. This is an exciting development for UHC and means we can provide additional secure homes for eight new member families and it also gives us a stronger financial base for the future. 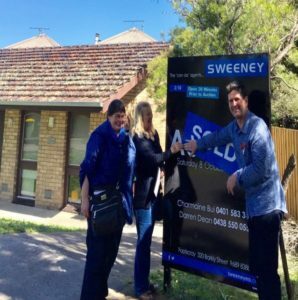 The Property Development Committee and staff have been very busy with this new project and have finalised the purchase of three units in Footscray and three in Hobsons Bay and are looking at three other properties as of October 2016. The Tenant Selection Committee and staff have also been busy organising the first Information Sessions for new prospective tenant members and interviews are to be held in the near future. Existing members will be offered the opportunity to inspect RAPID properties. The Board is encouraging members who are living alone in large houses to downsize so that we may better utilise our existing stock. Finally, it was very pleasing to see members response to this new development at the General Meeting and the way Board members and staff have embraced this opportunity to assist families in need. This is a fantastic example of the community spirit which is still alive and well within UHC and I trust we will all continue to welcome new tenant members into our Cooperative.